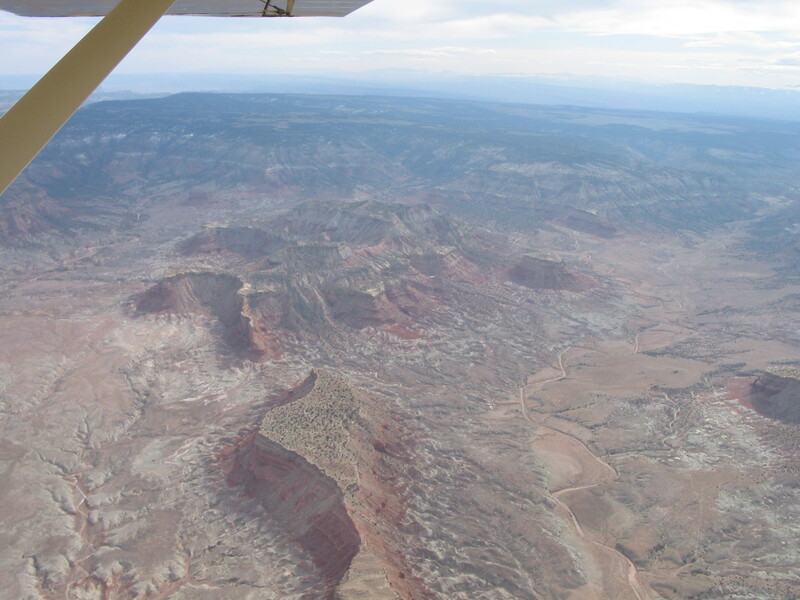 One of my inspirations for learning to fly was the prospect of exploring the canyons of southern Utah by air. In the Spring of 2005 I got to do this. Following is the journal of this trip. See also the photo gallery for more photos and less text. 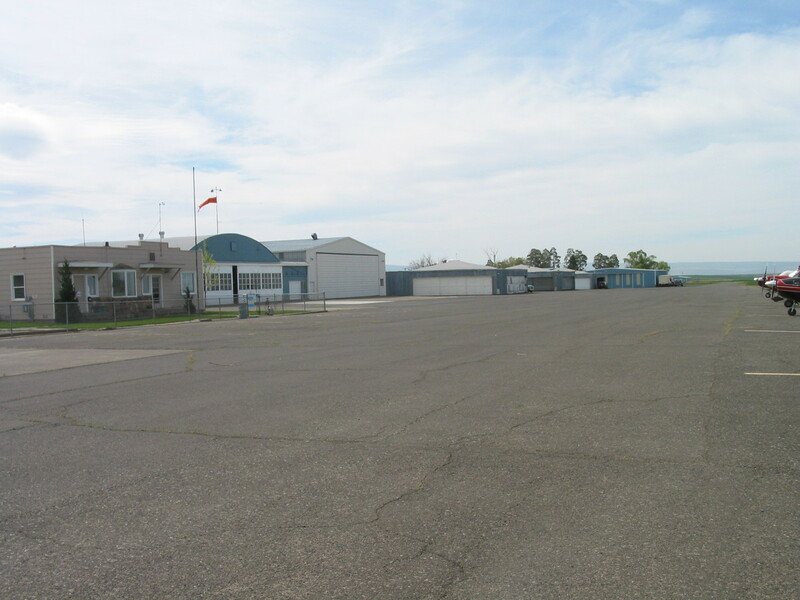 On Wednesday, April 6th, Marie drove me to Paine Field, we loaded the plane, and I took off for Utah. This was the longest and furthest air trip I've taken. Only once before have I even crossed the Cascades. The weather favored me. I was able to cross the cascades at Snoqualami pass, fly over the Snake River Gorge, and camp at Garden Valley in Idaho. As Idaho back country strips go, Garden Valley is easy to get into but it was sufficiently interesting for me. Once on the ground I realized that arriving by air is very different: I had no idea what the local culture was. If I had driven in I would have seen what the towns where like as I passed through them: what kind of businesses and how they were doing, signs along the road. In the evening I got on my bike and road into town, or what there was of a town. I passed two real-estate offices, a gas station, and turned around at the post office. The next day I flew over several new housing development. I think that Idaho valley living is popular and that the locals are selling little slices of Idaho heave to out of state folks as fast as they can carve them out of the forest. 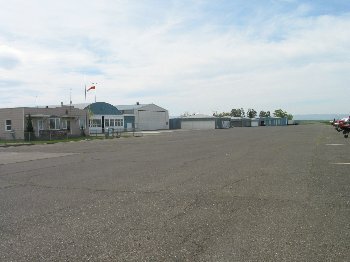 Martin field out side of Walla Walla. All the small airports I stopped at were very friendly. Garden Valley in Idaho where I spent the night. 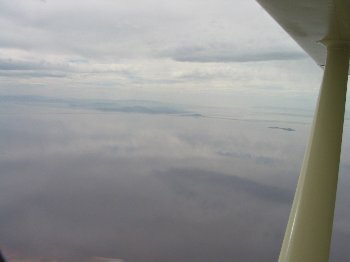 Crossing the Great Salt Lake. In Mountain home the airport manager lent me his own car to drive into town for breakfast. West of Salt Lake City I stopped at Toolele Valley. It is a fairly empty, wind swept place but the gas is cheap. I then followed the road to Price, crossing "Solder Summit". This is the route we follow when driving to Utah. 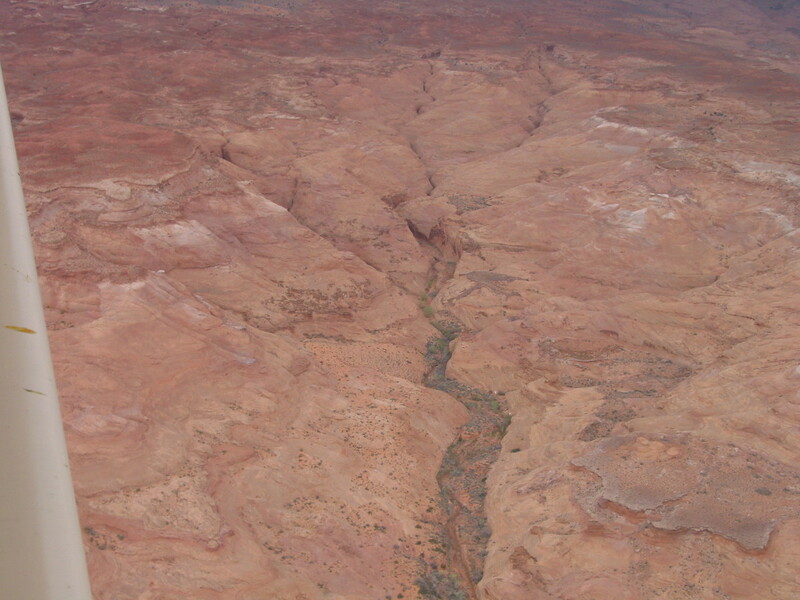 Dropping out of the mountains I fly over the southern Utah landscape for the first time and it is spectacular. 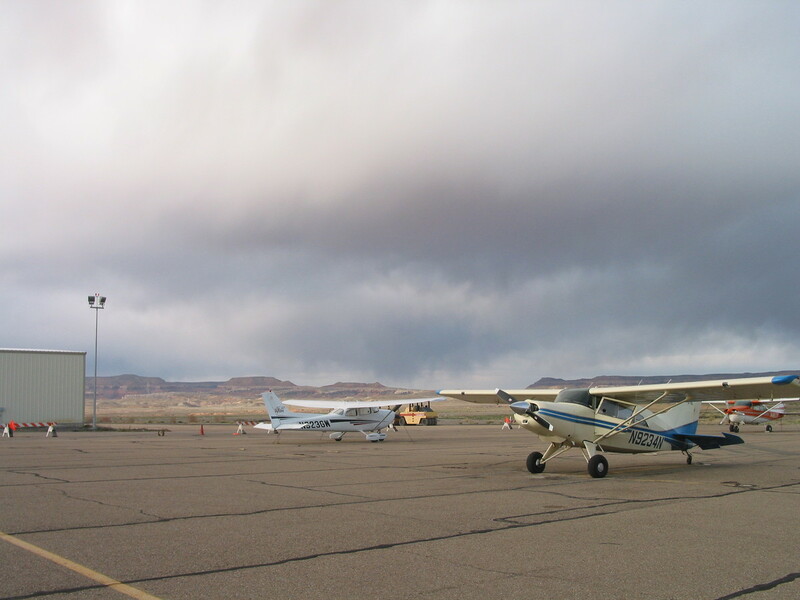 I land in Moab, completing my first significant cross country trip by airplane. 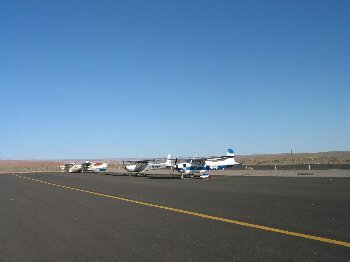 Canyonlands Airport, outside of Moab. Over a month ago I schedule some flight lessons with Lavar Wells for Friday and Saturday. I think that calling so far in advance from such a great distance surprised him. Lavar forgot to get my phone number and there was something in his voice that made me think I didn't need to call and confirm. As a result, I was on his schedule but he was not sure I would really be there. Well, Friday was very windy and we never did go flying. Saturday Lavar made plans to attend a wedding. Lavar set me up with another instructor, Larry Newby, for Saturday. 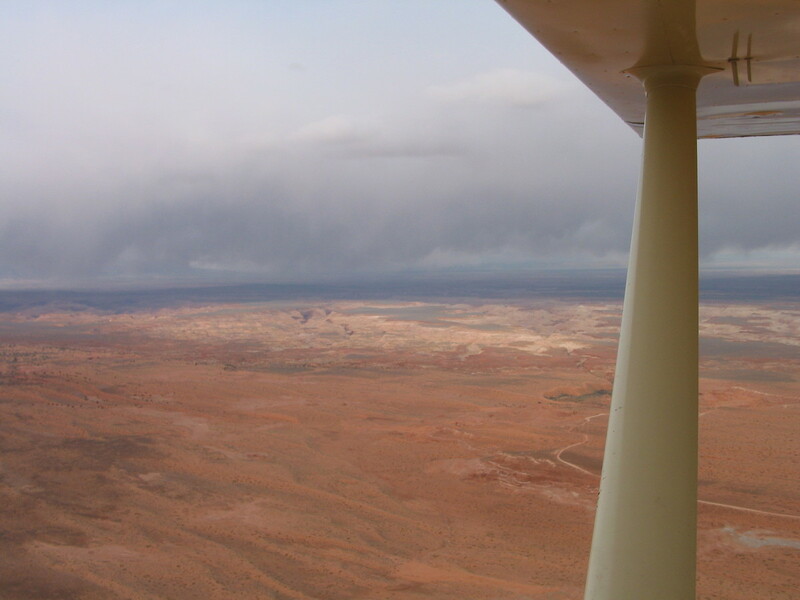 4/9 - My First Flights IN Utah. 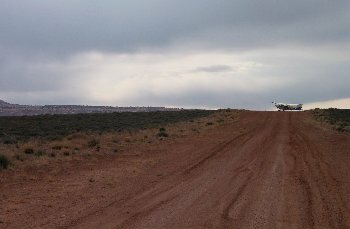 Saturday arrived calm and I decided to get myself over to Hanksville where Marshal and Megan were meeting me. This wind was intimidating me and I didn't want to get stuck in Canyonlands for another day. On the way I spotted a slot canyon. Exciting to see these things from the air. I circled to take pictures and marked a way point in my GPS. I realized that I was passing near Angel Point. This being one of the easier back country strips I thought I'd try landing there. 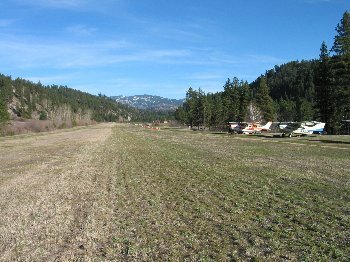 I had imagined a large, graded gravel runway. In reality it is more of a wide spot in the road with two humps, one near each end. Though off center I had a very smooth landing, touching down on the backside of the first hump and stooping at the top of the second. 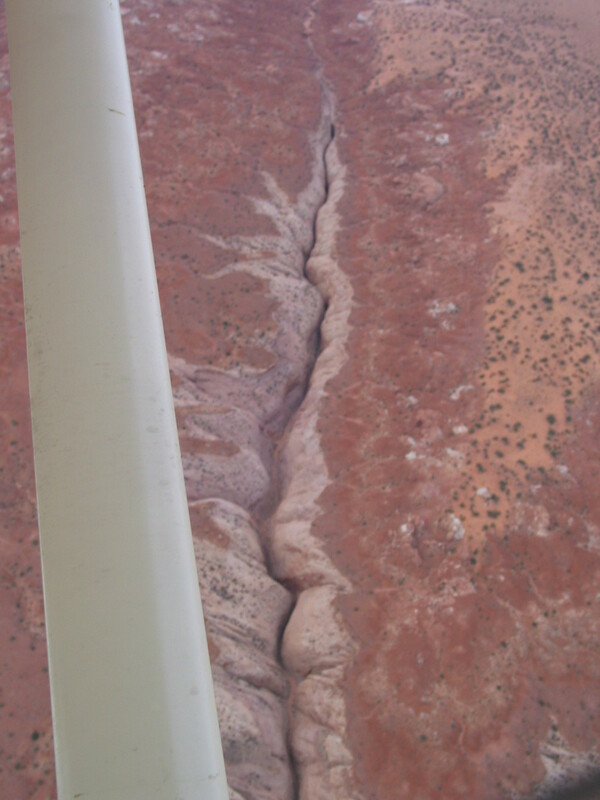 Slot canyon spotted from the air. Some rain clouds gathering over the mountains. 9234N parked at Angel Point, my first Utah back country landing. Leprechaun Canyon in the North Wash area. 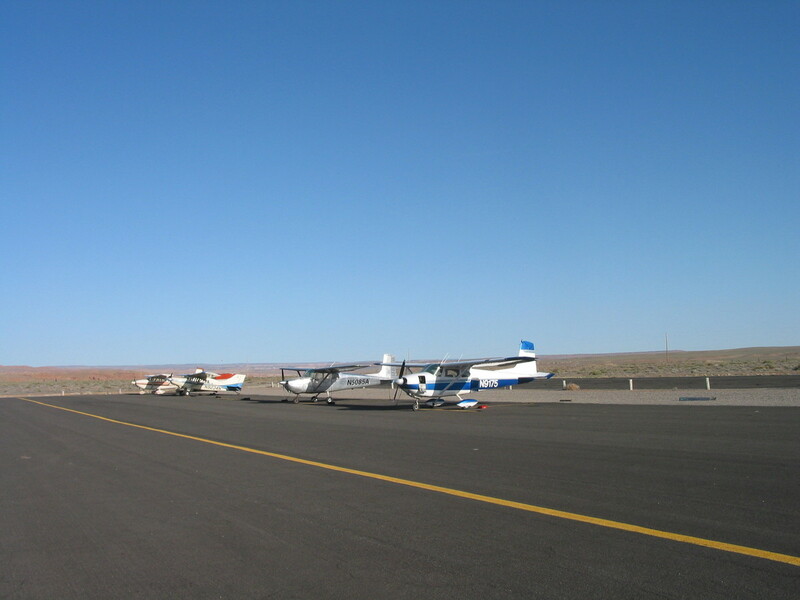 Hanksville has a huge paved runway, a large dirt cross wind runway, and a good tie-down area. I checked in with Larry and made plans to fly with him on Sunday. I checked in with Marshal. they were on schedule to arrive at 8pm. So it's late morning and I'm wondering what to do with my self. 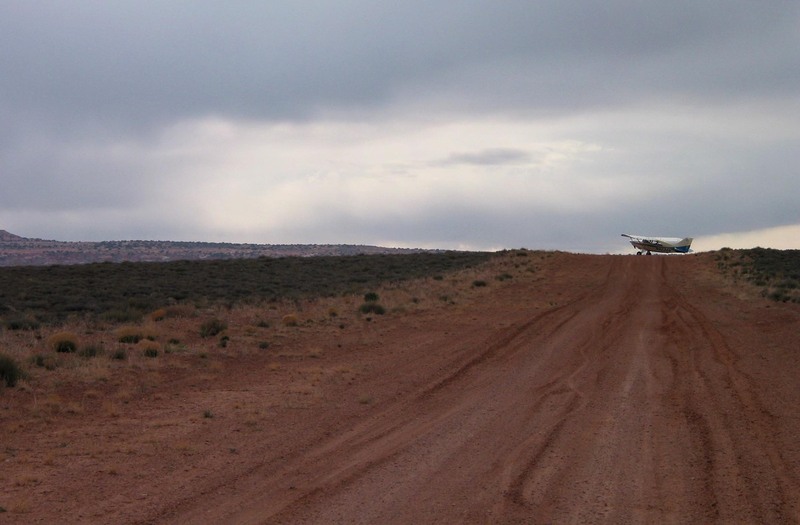 I take off and practice landings at Hanksville. 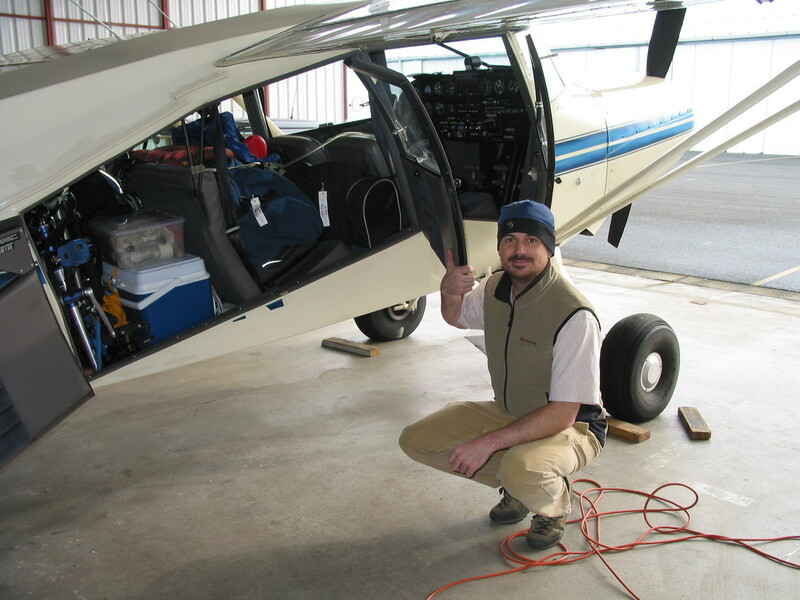 After some rough landings on the way down my confidence is shaken and the practice helps. Now it's noon and I'm wondering what to do with myself. I bike into town, buy some food for dinner, and return. Now it's afternoon and I'm wondering what to do with myself. I realize that I have an airplane and could just as easily be hanging out at Angel Point as at Hanksville. Once up in the air rain showers block me from Angel point so I head south to the North Wash area (east of the Henry Mountains) where we'll be canyoneering with Post 84 kids in the next couple days. 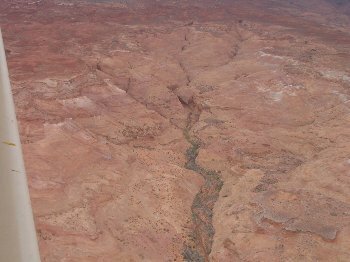 I fly over the slot canyons then over the nearby roads, looking for good camp sites. Clouds continue to form north east of me over the Dirty Devil and I realize that I'll not make it out to Angel Point. In fact, they seem to be filling in between me and Hanksville. I head home, squeezing between clouds and the Henrys. 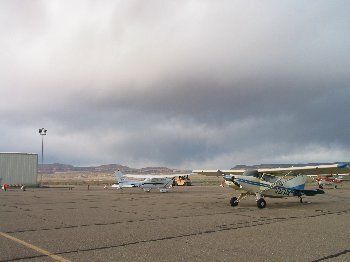 A couple minutes after tying down my plane the clouds open up and heavy rain falls. In the distance I see that hills just a little higher than me are collecting snow. Strange how this storm moved in from the east, backwards of what I expected. Megan and Marshal arrive at 8 and I cook dinner for them. Nice to share with friends after several nights solo.